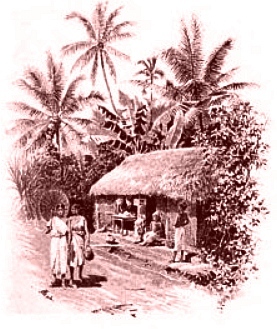 There is an old tale that Ceylon had once been the location of paradise where Adam and Eve had lived prior to the fall of mankind. If that is true, our ancestors had enjoyed a truly heavenly place. Those who have seen Ceylon will understand the size of the damage caused by the frivolous game with the apple. This island, embellished by the incredible attractions and wonders of the tropical nature, inexhaustible in its delightful imagery, blessed with an exhaustive creative force, lost for all mankind for the sake of a single apple! The richness in vegetation taunts all possible description, not a single spot resembles another one. At every step, every drive, I might say, at every turn of the way the images changed. Now there are palm groves, then giant bushes covered in lianas and orchids, then cactus-like Euphorbias with magnolia-like totally straight branches that captivated us. In between are flowers of the most colorful kind such as the purple red Gloriosa superba and a sky-blue Ranunculacee. Scintillating butterflies fly from flower to flower. Striped squirrels (Sciurus palmarum) run up and down the trunks, the most colorful birds, parrots, bulbuls, kingfishers, herons and bee-eaters cross the sky. For today, a trip to Kandy, the old capital of the kings of Ceylon and the favourite spot of the present governor, was planned. The city of 20.252 inhabitants is 119 km distant from Colombo. At 9 o’clock, I went on land and through the guard of honor to the railway station of the fort where another honor guard was waiting. Most lovely to look at was a tame antelope with gilded horns – black buck of the English – that was a mascot of the music band. The governor and his entourage and we mounted the wagons oft he Kandy railway which are very suitably and airily built and operated for the climate. Sinhalese act as railguards while the conductors and civil servants are Europeans. In spite of the large costs of the enterprise it is highly profitable thanks to the tea exports and the native predilection for train trips. The railway tracks led first through thick banana and palm groves which alternated with extended rice plantations. The rice harvest which occurs twice per year had been completed shortly prior to our arrival and so the heavily watered and terraced fields were most fresh and of young green color. Everywhere there were buffalos standing up to their head in the water, surrounded by cowboys who looked almost snow-white from the distance. At Rambukkana station, the railway starts to enter mountain territory and the panorama changes. Ever steeper and steeper the railway tracks snake upwards. Tunnels and overhanging stone galleries follow, everywhere there are sources, brooks, rivers which descend in the fastest path towards the plain and greatly enliven the scenery. The eye is feasting on the blue mountain peaks and the deep-cut jungle valleys – it is, I might say, a Semmering-Bahn transposed into a tropical world. A high black rock cone standing tall beside the track has gained sad notoriety as a Tarpeian rock during the time of the kings of Ceylon of the Mahawani family, as these rulers pushed inconvenient prisoners down into the abyss to their death. Close to Kadugannawa station is a monument to Captain Dawson paying tribute to his construction of the first stage of the railway. In front of Kandy, the rice fields are displaced by tea and cacao plantations which offer a pleasant impression with their deep green leaves. At the station at Kandy we were festively received. A honor guard of native volunteers presented arms while a newly organized mounted guard of native noblemen rode on excellent ponies in front of our government carriage and behind it. All Kandy was outside. Thousands of Sinhalese and many Europeans stood at the roadside or on the verandas to greet us and welcome us most friendly. Kandy is very picturesque situated in a greenish smiling valley and distinguishes itself through its clean houses and mild climate. Near the ruins of the old royal palace, gigantic, strongly anchored walls with imaginative crenelations, was installed a towerlike triumphal arch built out of bamboo and palm leaves. On the other side of it was the fairylike garden of Government House or Pavillon. Bamboo and rubber trees of unimaginable height, covered in blooming lianas, form an alley that leads to the Government House. It is built in tropical style with wide stairs and large airy halls and offers a very pleasant stay. I first paid my compliments to Lady Havelock and was then presented by the governor to a numerous delegation of native noblemen, the old hereditary nobility of Ceylon, where the following protocol was observed: I stood in the middle of the large hall while the individual members of the delegation came up singly, bowed deeply, the vice governor declaiming their names which were particularly long. The costumes of these dignified, long-bearded men are most imaginative: On the head they wear a four or six-pointed flat red hat on which is fixated an agraffe with a jewel. The upper body is covered by a small jacket wrought in gold. On the breast hang different amulets and badges on golden chains which are often heavily trimmed with diamonds. Among the jewelry, I especially noted a flying eagle decorated with rubies and emeralds which is said to have been owned by a minister of the last king. In broad belts are knives with richly ornamented blades. The strangest part of their attire, however, was the way they cover their lower extremities. Firstly these are covered with white narrow trousers that reach down to the ankles, around which are wrapped 54 m of muslin – a task which requires more than two hours. This somewhat strange costume turns their wearers into comically walking pears. After the parade we rested. At the start of the cool evening we paid a visit to Buddha’s tooth, the largest sacred site of the Buddhists. With ear-shattering tam-tam noises and drum music we were received by temple guards and high priests at the foot of the temple and led inside by a number of small stairs. In the entrance hall, numerous priests, all with heads clean shaved and clad in yellow Sarongs, were smilingly bowing standing at attention. After a few rooms with images from the life of Buddha I was in a square dark Sanctuarium lit only by a few lamps in which the musty smell of decomposing cut flowers, present in great number, flowed towards me. The high priest mumbled a few prayers and then showed me the tooth which lies in a large golden rose. The god Buddha must have had giant dentures because the tooth measures 5 cm in length and 25 cm in width. It has a dark chestnut brown color and is said to be made out of ivory smuggled in by clever priests after the original tooth had been burned by the Portuguese. Many pilgrims and processions arrive here to this sanctuary annually. The tooth is encased in six or seven tower-like covers made out of massive gold and decorated with gemstones, true masterworks. The whole is kept in a barred cage that contains also another object of value, a 12 cm high statue of Buddha made out of a single pure emerald stone. We saw here also a second relic with many especially crystalline Buddhas as well as the temple library which keeps old Sinhalese writings etched into palm leaves. Then we drove to the 6 km distant majestic botanical garden of Peradeniya which exceeds everyone’s wildest expectations by its variety of plants and trees as well as its tasteful composition into groups. The tropical climate that supports the gardener’s art is capable of achieving nearly fairy-like outcomes. Peradeniya is said to be the most beautiful botanical garden in the world. That it is unmatched I can firmly believe. The chief gardener tasked me with planting a tree to commemorate my visit, as did the Prince of Wales and the Tsesarevich. The tree planted by the first has already reached a sizeable height. The orchid collection of the park is housed indoors with straw mats replacing glass windows to safeguard the plants from the intense sun rays. Lady Havelock which we encountered in that part of the garden with her daughter invited us to a cup of tea in the garden pavilion. At 8 o’clock there was a grand parade dinner in Government House in Kandy which was attended by numerous dignitaries and multiple ladies. Giant Indians with long spears were set up in the staircase as a guard of honor. The table in black and yellow was richly decorated with flowers. For the delicious meal, musically accompanied by the band of the 6th regiment that played lovely melodies, I sat between Lady Havelock and the German wife of our consul general Schnell, who was born in Calcutta. At the end of the dinner the governor declared a toast to the queen’s health, to that of our emperor and to mine, accompanied to the people’s hymn. After the conclusion of the dinner, a religious procession called the Perahera procession, which is performed but once a year and which is attended by all the nobles of the land from the most distant places with their attendants and their elephants to create the largest pomp possible, started in the large forum in front of the Buddha temple. The glittering procession of the dignitaries, the nobles and the men, the majestic elephants, the gaudy play of the colors, the glittering and sparkling gold and gems, the activities of the crowd, the performance of fantastic dances, the magic scenery – all covered in a clear light of torches, turned it into a Arabian Nights fairy tale. The procession moved with a deafening sound of the drums past the Buddha temple on whose dais all guests of the governor and the members of the English colony had taken their seats. At the front of the parade marched a beautifully ornamented giant elephant that carried a representation of the golden hull of Buddha’s tooth on a rich silk blanket. The giant was escorted by two smaller elephants, then about a hundred Sinhalese with colors and torches came. Then, surrounded by dancers moving in grotesque jumps, followed the nobles of the land in their dress sparkling with diamonds. In the procession of at least 800 to 1000 m length were assembled forty elephants ornamented in the most diverse of trappings. All houses up to the roofs and the whole large forum were filled with the mass of the united country folk which set up a captivating strange background in their red and white Sarongs and the disquieting changing illumination. Twice the procession passed by us. Then we returned home to the governor’s pavilion, enriched by the interesting day’s events. ANNO – on 06.01.1893 in Austria’s newspapers. The Panama scandal in France is always a good topic to fill the pages, apart from the snow storm that is. The k.u.k. Hof-Burgtheater is playing „Krisen“ – a character study by Eduard von Bauernfeld; the k.u.k. Hof-Operntheater presents a French opera „Der Prophet“. Dieser Beitrag wurde am 6. January 2018 von wordpressadmin in diary veröffentlicht. Schlagworte: Ceylon, Colombo, January, Kandy, sightseeing, train.